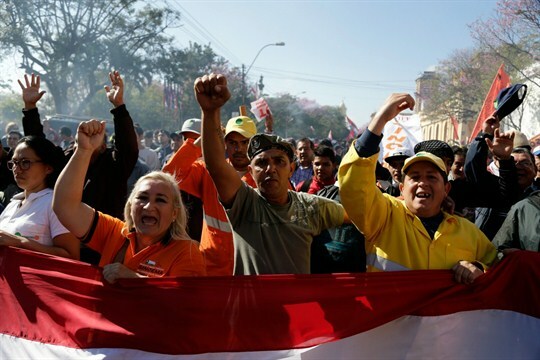 Thousands of workers and retirees protest against a proposed pension reform, Asuncion, Paraguay, Aug. 23, 2018 (AP photo by Jorge Saenz). A narco boss bribes multiple justice ministers from prison and luxuriates in a VIP cell. A senator is recorded boasting about buying off judges, but is still re-elected thanks to a closed party list system. Taxpayers foot the bill for medical insurance covering liposuction and implants for low-level public employees.